Today as I signed into my Hotmail account using Hotmail.com, it was nice to see that my account had automatically upgraded to Outlook.com. Since the last two weeks Hotmail users were getting notifications mail that the upgrade will take place soon by next week. They had received this mail few days back from Outlook team informing that you have been upgraded to Outlook. As I check my mails in mail client, Windows Live Mail , I didn’t check to see until today using the web interface, to see if I had been upgraded. But when I signed into Hotmail.com today, it was nice to see being upgraded to Outlook.com. So Hotmail and Live users – don’t be surprised if your accounts gets upgraded to Outlook automatically. Outlook.com is personal mail from Microsoft. It’s a modern cloud email service that has a fresh and intuitive design, connects with Facebook, Twitter, and soon, Skype; works seamlessly with Office and SkyDrive, and respects your privacy. 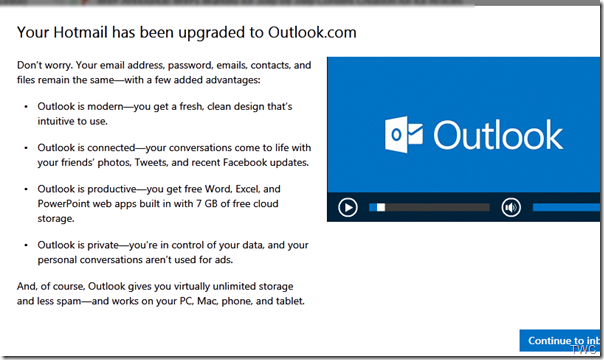 Hotmail customers who were upgraded automatically to Outlook.com were notified in advance via email. When your are upgraded & you sign-in for the first time after the upgrade, you’ll get to see this screen, providing information on various cool features of Outlook. 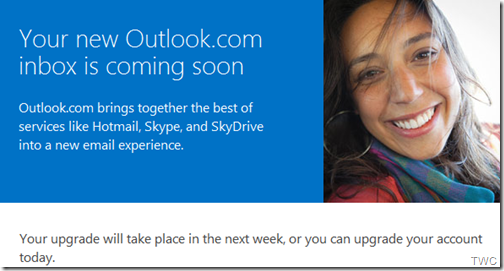 How to upgrade to Outlook.com from my present Hotmail account? If you are not yet upgraded & want to upgrade now, just sign in to Hotmail.com & from top right ‘Options’ , you’ll get the option of ‘Upgrade to Outlook.com’ . Or simply go to http://outlook.com in your browser and sign in with your current Hotmail account. When Outlook.com was launched, Microsoft has shared its plan of upgrading all its present Hotmail customers to Outlook.com. This upgrade is gradual and as said, has started. Hotmail customers were notified in advance via email about the automatic up-gradation. Can I switch back to Hotmail? 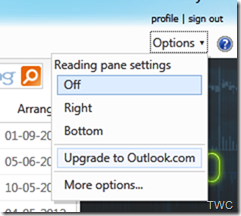 If your account is upgraded automatically to Outlook, the option to switch back IS NOT available. To just check, sign-in to Outlook.com and click on the Options icon, & if its available, you’ll see the option ‘Go back to Hotmail’. But as said eventually your account will be upgraded. What happens to current email address? You continue to use your existing @hotmail, @live, or @msn addresses after upgrading to Outlook.com UI. Or if you want you can get a new @outlook.com address – there are several ways to do so. So if you see your Hotmail, Live accounts being automatically upgraded don’t be surprised. Just enjoy the fresh, clean design of Outlook.com. UPDATE: Outlook.com has been voted by @Time Magazine as one of the 50 Best Websites of 2012! – http://t.co/UtBzoCTU. Thanks for the excellent explanation , Gregg! As a Language purist, I fully agree about the word. But as you said it has started appearing in various dictionaries, specially as an Indian variation. Many words have been adopted from Indian English and hope this also gets in the due course of time. We will take note of your suggestions! Thanks again !